A church has stood on the corner of Banff Avenue and Buffalo Street since 1886, the first to be built in Banff. Our present building was constructed in 1927, following the 1925 formation of the United Church of Canada. The United Church is a denominational union of Canadian Methodists, Congregationalists, and Presbyterians. (A portion of the Presbyterian churches remained as the Presbyterian Church in Canada). Rundle Memorial United Church is named after Reverend Robert T. Rundle, the first Christian missionary to arrive in Banff. Rundle did not begin a congregation here but his influence is much acknowledged in the area. This Wesleyan Methodist came from Cornwall, in south-west England, in the years 1840-1848. 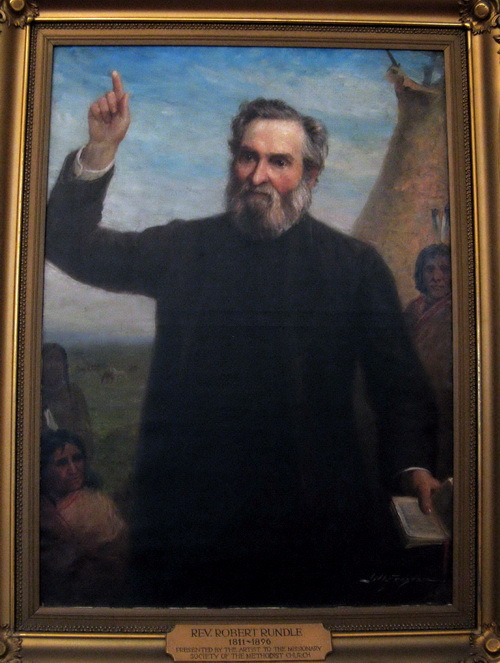 He was in the employ of the Hudson’s Bay Company, but his work was primarily with aboriginal people. From the mission at Fort Edmonton, Rundle travelled by canoe, horseback and foot. Terrace Mountain was renamed Mount Rundle at the instigation of Sir James Hector of the Palliser Expedition (1857-1860). Rundle may have climbed this mountain in one of his visits to the area. Only experienced hikers should attempt today’s trail, which dissolves on a steep slope at the top. An oil painting of Rundle, done by renowned portrait artist J. W. Forster probably in the early twentieth century, hangs at the rear of the church. The work is the only known painting of Rundle in existence. A copy of Rev. Rundle’s ordination certificate is on display in the glass case under the painting. Other relevant photographs hang in the Lonsdale Lounge to the left of the front of the sanctuary. You may also browse through The Rundle Journals, a hard cover book in the Church library, also located in the Lonsdale Lounge.